I tried to think of a funny title about having a hole in the leg but I’m fresh out of ideas. Suggestions welcome! I met with Amazing Vet this morning. She was very excited to see slightly less drainage, and no increase in the size of the hole. We are hopeful that is had plateaued and will hopefully not get much larger. Fingers crossed that it starts getting smaller at some point! He tolerated having it hosed pretty well, and I then I hand grazed him to let the leg dry out a bit. Surprisingly, he walks on it with no signs of discomfort. Hard to believe one can gave a gaping hole in the leg and still walk around normally! After re wrapping it hr got to go onto the small front paddock and he happily rolled right away then grazed for about an hour. It makes my heart happy to see him acting so normal! The new antibiotic (something that starts with a c for those curious) has to be given orally 3 times a day 6 hours apart, which is a problem. My barn is a small private facility that does not have 24 hr barn staff. It is also a 35 minute drive away in no traffic. I’m going to get really familiar with the drive though because I’ll be going out there every evening to do one of the 3 times. Sounds like a pain to most probably but I am happy to feel helpful and more then willing if this is what it takes to get him better! It’s a broader spectrum antibiotic, so we feel like it’s the best option since we don’t know what caused the hole. Rio is obsessed with likits, here is a cute video of him attacking his new one. Rio5.30.17 from Kelly on Vimeo. Thanks for the update. Poor guy. Are you putting anything on it topically or just a wrap? We are putting SSD on it which I think is helping too! Horses are so odd. Tiny ouchie and they can’t function. Hole in the leg? It’s all good, let’s go roll. 🙂 Glad he’s feeling a bit better! ?haha you are so right! Holy gaping hole! Glad he is feeling better and acting like a normal horse…a chill one! Makes healing better. sure kinda looks like a snake bite…but doesn’t have the sloughing skin. Ya we are considering snake bite too! Vet thinks more of the skin will slough off… we’ll see! It’s kinda gross, but part of the process. I had a dog that got bitten a couple of times. 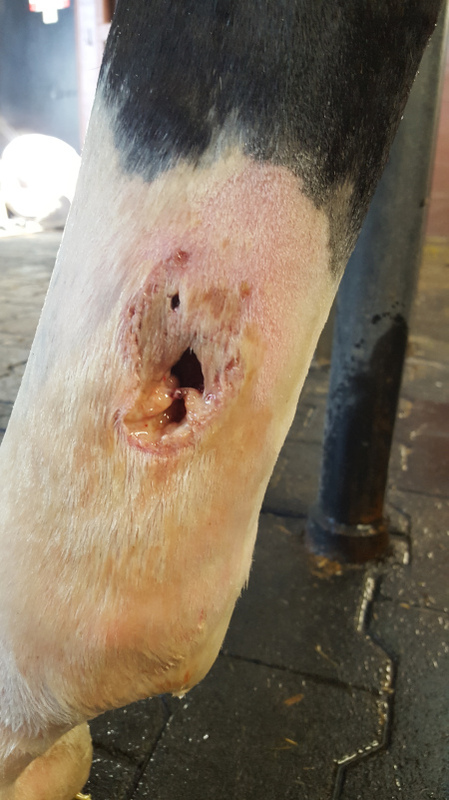 A long time ago lesson horse at my barn was also bitten on the muzzle — her head swelled up 🙁 She had a tracheotomy to breathe, but later you’d never know she had been bit–just a small rough patch on the muzzle, not even a scar from the tracheotomy. So glad to hear he is feeling good! This probably isn’t helpful, but my horse is not the best about oral antibiotics and when he had to be on a broad spectrum one there was something injectable that would last for like 10 days for the first injection and then a month for the second. I was more expensive than the oral antibiotics–if I can track down the name of it I’ll pass it along to you. I’d be very interested to hear! My vet told me it wsd this medicine or this other one that you inject daily IM but if it accidentally hits an arterial bed the horse will fall down dead in seconds. She said that pretty much only trained vets can use that one. Oh wow, the daily IM one sounds like procaine penicillin or something like that, in which case I wouldn’t use it, either! I found the name of the antibiotic — it is called Excede (brand name). Might be worth asking about but maybe not if it’s not the right kind of antibiotic. It is definitely not a daily injection.